Juventus coach Antonio Conte has been banned for 10 months after an investigation into match-fixing. 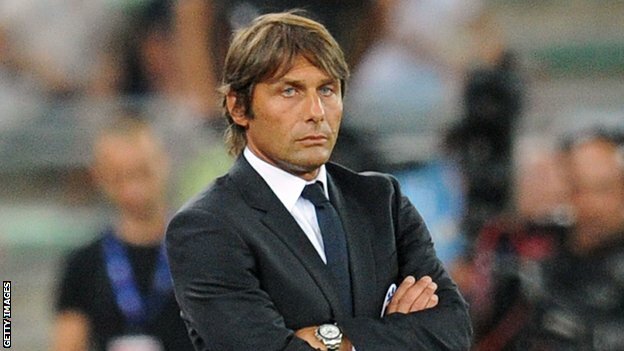 Last year Conte, 43, led the club to the Serie A title in his first season in charge without losing a single game. He was accused of failing to report alleged match-fixing involving former club Siena in the 2010-11 season. Conte, whose assistant coach Angelo Alessio was also banned, is set to appeal the decision and Juventus said both retained their full support. Charges against Conte of direct involvement in match-fixing were dismissed last month, but the Italian Football Federation (FIGC) said it was satisfied Conte was aware it was taking place during his time with Siena. Conte had a plea bargain deal rejected by the FIGC earlier this month. He put forward a proposal which would have seen him serve a three-month suspension and pay a fine of 200,000 euros. The federation has now confirmed the 10-month sanction. Police had previously said Conte was being investigated on suspicion of sporting fraud and fraudulent association over allegations concerning a match between his Serie B side Siena and Novara in April 2011. In addition to the ban for Alessio, who was Conte's assistant at Siena, former Lecce president Giovanni Semeraro and ex-Grosseto president Piero Camilli are also facing suspensions.